For this week, the message from Archangel Gabriel is reminding us about the transformative power of Gratitude. Be Grateful for All That You Have and All That You Are. Gratitude is the attitude that gives us the inspiration we need so we can feel more love and appreciation for our lives. That is because Gratitude is a powerful energy surge that raises our vibrational frequencies to the level where we can see beyond the immediate appearance of disharmony to the truth of the dynamic force of the Divine working in our lives. This expansive presence of Pure Potential can work with us to create a life that is more in keeping with what we want to experience. It responds to our thoughts and feelings directly. In the new energy system in which we are living, we have clear choices about how we want to live. At this time of heightened energy frequencies, we have been given a blank slate where we can formulate our lives. We do this by asking the Universe to work through us so we can be in alignment with the highest wisdom of our Soul. Though this may sound simple, because of our habitual ways of thinking, it takes an extreme focus of attention on what we truly want to experience instead of what we don’t like about ourselves and the lives we are living. Our focus of attention is a powerful tool, simple but not easy; empowering or disabling, according to the magnetic energy we are projecting into the fields around us. Physics tells us that we have a field of unlimited potential waiting for us to seed our futures. The magnetic energy of our thoughts and feelings is the seed that creates attraction to a different experience. That is why keeping our energy frequencies as uplifted as possible makes such a difference in what we are experiencing in life. When there is nothing else we can think of to do, being grateful can be the key that turns the tides of our feelings into the channels of new life and Wellbeing. It is an amazing and powerful tool just waiting for us to put it into action. With this simple tool you can transform your world as you become more grateful for all that you already have in your life and what is being offered to you from All That Is. Consider how fortunate you truly are, how much Beauty there is in the world, and open up to new feelings of Gratitude and Wellbeing. Just like a dial on a radio, changing the channel to the one that beams out Harmony, Joy and Love will gift you with a totally new perspective. Then naturally your magnetic field will radiate more of those good vibes, and through the Law of Attraction, your life will begin to make some big changes. That is just the way it works. Thank you for this life I have been given in which to explore, grow and share my gifts. Please work through every aspect of my life today, bless all that I do and say. Help me to be a blessing in every way. Thank you for assisting me to see the Beauty all around me and receive the Grace that is being offered to me at this time. May I bring my Soul’s gifts into my physical reality and use them to be a greater blessing to the world. Thank you for empowering the Love in my heart to shine into every area of my life and bring it into greater alignment with the highest wisdom of my Soul, now and always. Thank you God, and so it is. You have so much to be grateful for. At times it may feel as though life is hard, and yet if you can pull back from its drama, you will see how fortunate you truly are. Even the lessons you are now going through are a blessing. Though it may feel as if you don’t have enough — whether it’s time, money, health, or love — you actually have been blessed with a tremendous gift. That gift is your life. A physical body is a wondrous blessing. Take time to observe the miraculous occurrences in your body. It is a miracle that messages are transmitted from your brain so there is movement in different parts of your body. It is a miracle that you don’t have to tell your heart to beat or your stomach to digest. The physical body is a constant source of awe when you consider it a gift from God. You are to use this body to learn your lessons in life and to help bring Heaven to Earth. You are here to create a better world for all. You are here to learn to find peace and harmony within yourself so all people on earth may experience this. One person finding inner peace helps to bring Peace to the entire world. You are a part of a wondrous Presence in whom you live, move and have your being. Divinity exists beneath all your tumultuous thoughts, and between your breaths. You are here to remember this fact, and to live in this awareness at all times. This Presence is constantly giving, and you can consistently receive the blessings available by focusing your attention on the truth of who you are. You can know that whatever situation is occurring in your life, or in the world, God is in the midst of it all. Be grateful for this gift of Universal Presence within you. Be grateful for your body and for the lessons you are learning which assist your spiritual progress. Take the time to see the beauty in nature — a flower, tree or bird — and be grateful for the beauty of the Divine there and within all things. Be grateful for the presence of the Angels in your life. These messengers from God are a powerful force for Love and Wisdom in your world. You can call upon them at any moment, and their assistance is available for you. This is a supreme gift. And be grateful for all that you are. You are a spark of Divine Light radiating God’s Presence on the earth. You are God’s Love expressing to others. You are God’s Wisdom remembering the truth of Divine Order in every situation. You are so much more than what you seem. Remember the expansiveness of your true nature, and be grateful. Your gratitude opens the floodgates for Heaven’s blessings. Gratitude creates an energy that beckons Good into your life. When you are grateful, you feel more peaceful and more fulfilled. It is easier to remember that God is within all people and situations. And you can begin to be a witness rather than being embroiled in life’s dramas. Do you trust in your own inner guidance? Do you want to strengthen your intuition? Would you like access to the wisdom of the Angels? 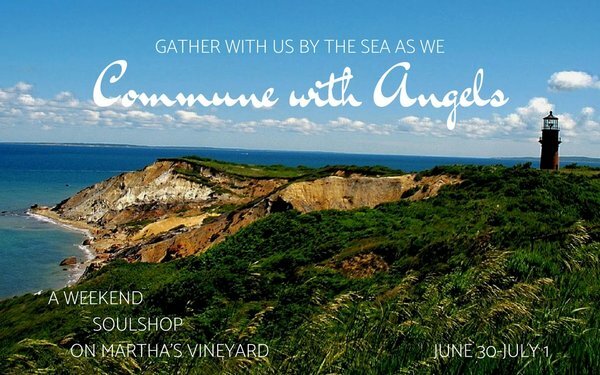 It is my honor to invite you to join me on the amazing island of Martha’s Vineyard, June 30 and July 1. Here, you will learn to hear your Soul’s Voice and establish a base of Trust within the heart. • Connect to the Light frequencies within you to create a deeper sense of Knowing. The timing of this workshop is designed so you can enjoy exploring the island of Martha’s Vineyard each day after the workshop is complete. Martha’s Vineyard is a charming light-filled island. Each afternoon you will have time to explore the shops, art openings, go to the beach, and breathe the revitalizing ions of the ocean air. At ease and refreshed, you are better able to assimilate the morning’s profound experiences. June 30 and July 1 ~ 9:00 am to 1:00 pm. Connect more deeply with your own soul’s voice! Do you live near Martha’s Vineyard?